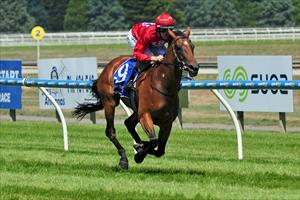 Danny O'Brien unearthed another classy three-year-old winner at Ballarat on Sunday when Wangaala romped to effortless five-length win. This winner was the fifth three-year-old O'Brien has had win in February following on from That Rings A Bell, Toffee Nose, Sacred Sham and Winkelmann. The Flemington trainer seems to have an abundance of decent types as he has also had some close calls with three-year-olds Verstappen and Silentz both nosed out in the past week. Top hoop Damian Lane has been on board four (Toffee Nose, Sacred Sham, Winkelmann and Wangaala) of these winners and he is in an envious position as O'Brien aims each horse towards better races in the Autumn. "They are all high-class fillies and colts and they could not have done any more at their last starts," O'Brien said. The Cox Plate winning trainer said he was thrilled with Wangaala, a daughter of Toorak Toff who is raced by Rosemont Stud, showing her class today. "I have always had a good opinion of her and I was impressed with the way that she put them to sword today as she won by five lengths unextended," O'Brien said.